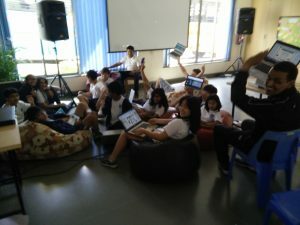 Last week, we celebrated the Computer Science Week through which we promoted the “Hour of Code” mainly by going to www.code.org/learn by also various other sites and apps you can find here. We offered various coding and programming activities for students of preschool through DP2. For instance, we had a Makey-Makey Photo booth and an Osmo Coding station. 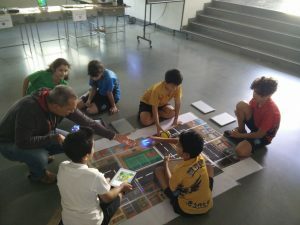 We also explored different robots: Beebots, Bluebots and Dash and Dot and programmed electronics circuit boards with Arduino. We looked at progamming language on Processing (to create visuals with codes) and were inspired by an e-textile project that uses neopixels on clothing. Many MYP students showcased their work on Scratch MIT where they created games. Finally, some professional coders from Accenture talked to us about the purpose and future of coding and had a few exciting activities for students to engage in unplugged activities. This event was a success because of the participation of various stakeholders: Tech Integrators, Teachers, EdTech Mentors (teachers and students), Parents and of course Students. Students really enjoyed the event and shared their excitement on a “thinking wall”. A big thank you to all who came to volunteer and to support this second edition of Computer Science Week at MBIS!